The final space shuttle crew, the astronauts of STS-135, stand with shuttle Atlantis after its landing July 21 at Kennedy Space Center in Florida. This story was updated on Aug. 16 at 2:30 p.m. ET. On Tuesday (Aug. 16), the crew will visit the American Museum of Natural History. They will speak about their recent flight and answer questions from New York City children in the audience in a public event that's free with museum admission. That night the spaceflyers will also appear on Comedy Central's satirical news show The Colbert Report, with host Stephen Colbert, which tapes in New York. And on Thursday (Aug. 18), the crew will speak at the Intrepid Sea, Air & Space Museum. First the astronauts will talk to more than 200 students, then they will meet with the public at two museum exhibits. The Intrepid was chosen recently as the retirement home of the shuttle test prototype Enterprise. 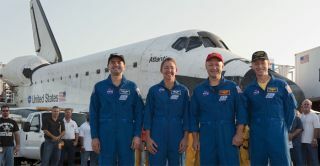 Editor's note: This story was updated to correct the date of the astronaut crew's appearance at the Intrepid Sea, Air & Space Museum, which occurs on Thursday, Aug. 18.